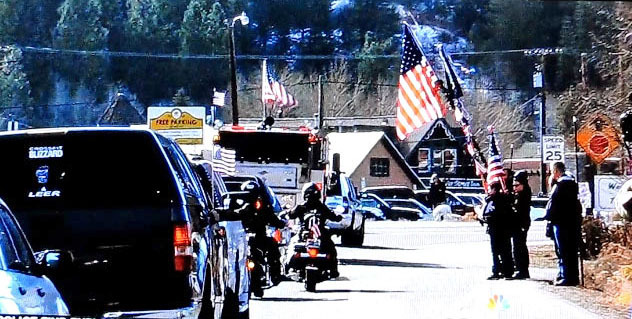 PGR had a great turnout to honor PO3 Brian Collins in Truckee today. About 75 bikes left Reno from Cabela's, and there were about 75 more bikes that met us in Truckee. We also had many cages that showed up with supporters to honor this young hero. 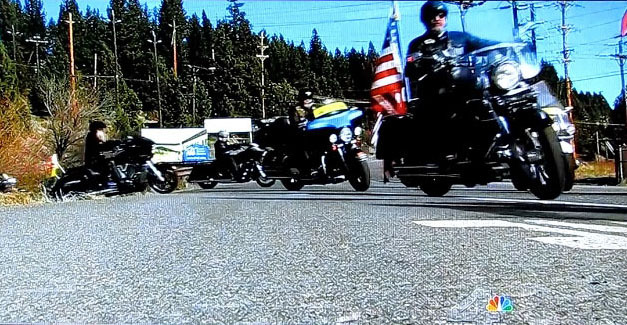 The Truckee police did a great job of escorting the long procession through the middle of downtown and it was very impressive to see the entire route lined with Truckee citizens holding their American flags or presenting a salute, or holding their hand over their hearts as we passed by. Ride Captain Bryan DeVoe did a fantastic job arranging all the logistics for this task, which seemed somewhat overwhelming at times. He was able to coordinate the Mortuary, Military, Fire Department, Police Department, politicians, as well as providing volunteers to even watch our bikes during the service. We had no disruptions, of any kind, from any protestors. The family was very grateful to the PGR and all the other groups that provided support. 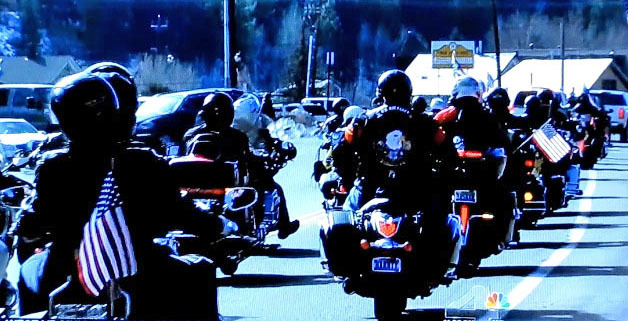 Those other groups included the Northern Nevada HOG Chapter, Ghost Soldiers, Vietnam Veterans of America, VFW Riders, American Legion Riders, Iron Nation, and many, many more. We also had James Bryant there with his support vehicle with extra flags and water for whoever needed some. We also had a PGR member from the Sacramento area, that goes by the name of Cowboy Bob, that showed up with over 60 flags to plant and display. However, the ground was too hard to set the rebar in, so he passed out all the large flags to people standing in the street at the entrance to the High School. It was a very impressive sight. 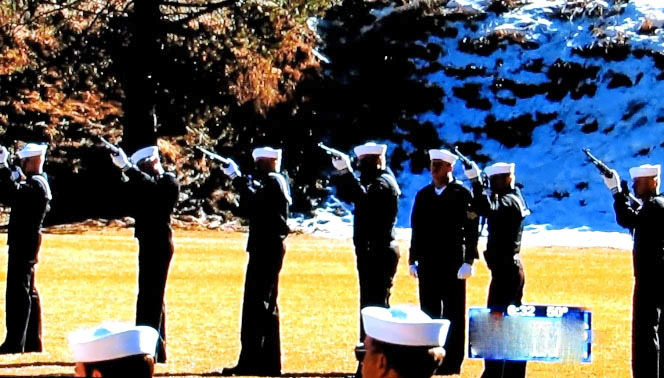 The Navy had a large turnout and did full Military Honors including a 21 gun salute and presented each family member with an American flag. 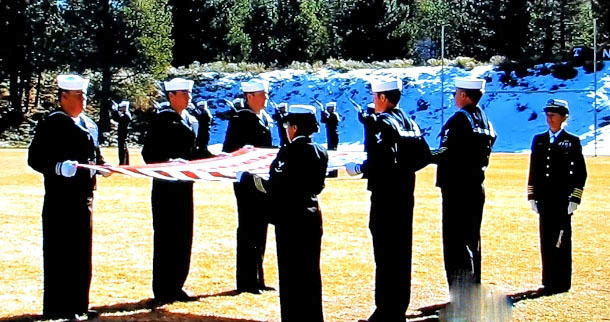 The Blue Star Mothers presented a Gold Star Banner to the family, in honor of Brian. The service then moved inside the school gymnasium where they held a Celebration of Life ceremony. There was standing room only in both the outside and the inside service. Ride Captain DeVoe presented Brian's Collin's widow, Cheyenne, a plaque from the PGR. The family was very grateful for all the support they received from all the groups and people in attendance. 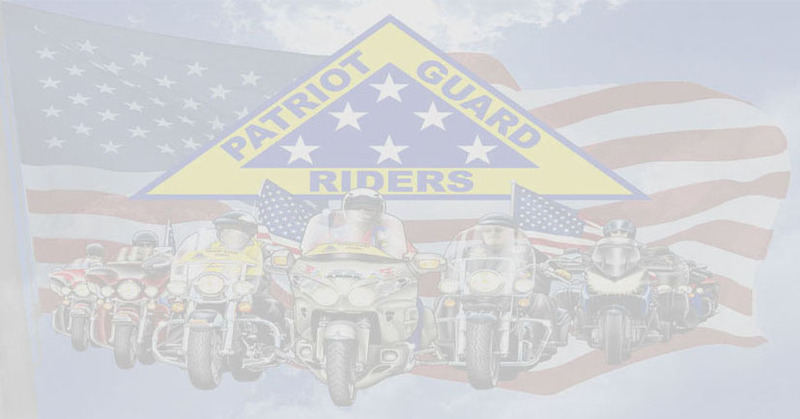 On behalf of the Northern Nevada Patriot Guard, I would like to extend my heartfelt thanks to all those who took time out of their day to honor this fine young man that gave his life in service to his country. Click HERE for TV4 News video. 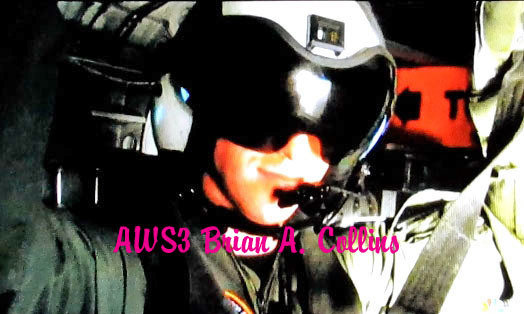 Hundreds came out to show love and support to the Petty Officer Third Class Brian Collins and his family, Saturday, and for a few hours this morning, time stood still to honor a young fallen veteran. 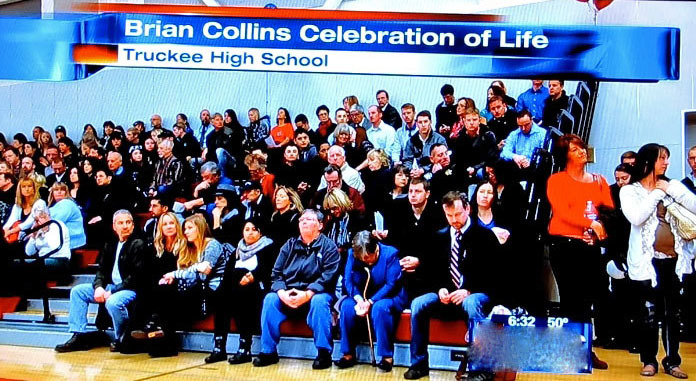 Family, friends, comrades, and neighbors gathered to honor and celebrate the life Truckee native, Brian Collins. His life was cut short at 25-years-old in a Navy helicopter crash this month. "It's overwhelming,” says his mother, Hollee Collins. “I knew Brian had an impact in the town of Truckee, where he was raised. Everybody has been so supportive." 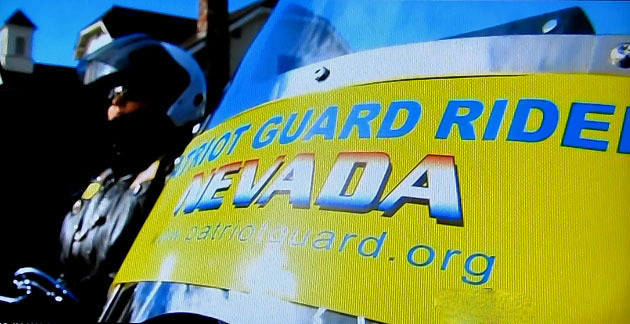 At his family's request, the Patriot Guard from both Nevada and California stood by as his ashes were transported to his alma mater; it’s an honor they're proud to uphold. 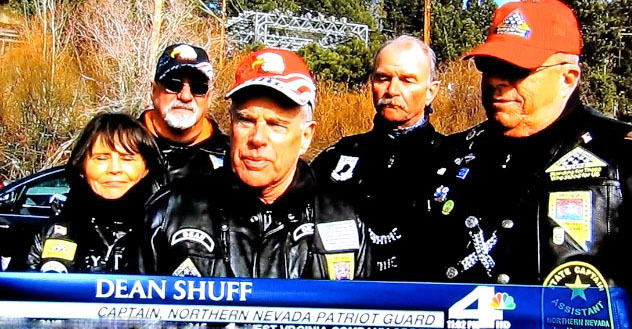 "Immensely so,” says Dean Shuff, Captain of the Northern Nevada Patriot Guard. “For all of us, it's a privilege." As the procession slowly moved through the town, community members saluted Collins from the sidelines with hats off and flags flying high. Every seat was filled at the high school football field where military honors were presented to the Collins family. 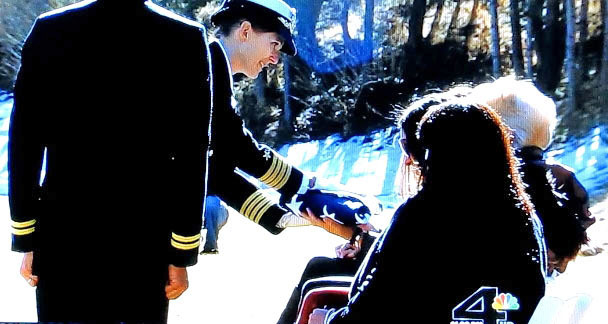 Each family member was presented an American flag to honor Collins' ultimate sacrifice, and a poem was read as a reminder that his spirit is closer than ever before. Now a gold-star mother, Hollee Collins chooses to remember her son in his element. "He would make you smile,” she says. “If you had a bad day, he would make you smile. He was a goofball." 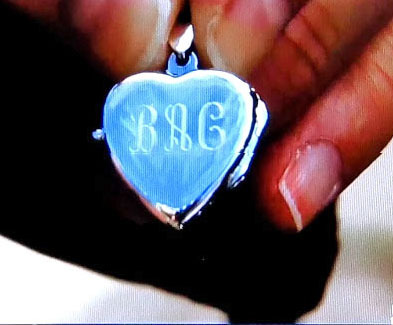 She says she'll always remember his smile, and hopes that bright smile will inspire a more positive outlook on life. 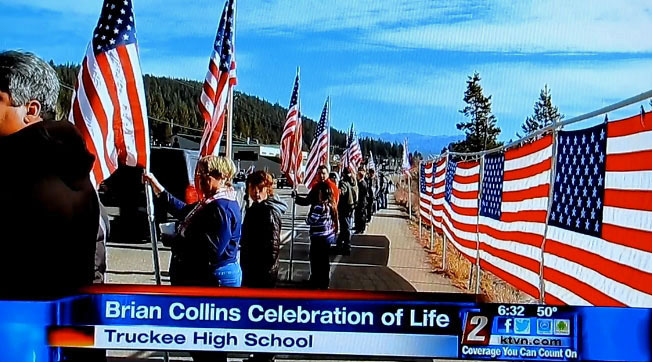 After the military honors, another ceremony was held in the Truckee high school gymnasium to celebrate Collins’ life.